Diecast, Kits, Railway, Slot Racing and RC Specialists Over 20 years in the model trade. 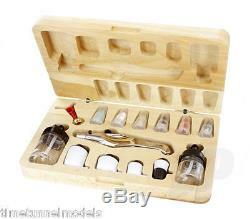 Aztek 4809 Single / Double Action Airbrush Set in Wooden Case (Multi Tips) by Testors Given that you might having got this far be wondering why you should choose an Aztek airbrush, we thought wed make it easy for you and highlight a few key qualities. So, to begin, well start at the end with possibly the most tedious part of the whole airbrushing process cleaning, or, if you like, the lack of it. You see, unlike standard airbrushes that get covered with paint and require complete disassembly to clean, Aztek brushes require no disassembly. Simple, because the paint travels directly to and through the nozzle, entirely bypassing the airbrush body. When it comes to orchestrating a task youll find time-consuming complex needle adjustments a thing of the past for with an Aztek airbrush you can quickly move from one spray pattern to another, laying down the full range of special effects simply by changing the unique, patented, interchangeable nozzles. And if thats not enough to convince you, give comfort some consideration too. If youve used airbrushes before youll relate to how important it is that the brush fits comfortably in the hand. With a good ergonomic design (an Aztek design), reduced fatigue and exceptional grip come naturally. In the 4809, then, Aztek has combined the ease and flexibility of its premium airbrush design with a high quality triple-chrome-plated body. Forged from alloy, the double action internal mix 4809 weighs a desirable 30 grams yet retains that sought-after ergonomic Aztek design. Add the full range of tips, paint cups, bottles, gravity feed colour cups and accessories, and youve got a modern heavy-duty airbrush system thatll provide both precision paint application and excellent durability. Key Features Patented Aztek nozzle for quick effects changes and minimal clean-up. Works as double or single action airbrush. Perfect for general and precise detail work. What's in the box 1 x A480 airbrush and 6 (1.8 mm) hose. 1 x Fine Line Nozzle /. 1 x General Detail Nozzle /. 1 x Acrylic General Detail Nozzle /. 1 x Acrylic High Flow Nozzle /. 1 x High Flow Nozzle /. 1 x 2.5 cc Side Feed Colour Cup. 1 x 3cc Gravity Feed Colour Cup. 1 x 7.5cc Gravity Feed Colour Cup. 1 x 10cc Gravity Feed Colour Cup. 1 x 28mm Siphon cap and bottle. 1 x 33 mm Siphon cap and bottle. 1 x Instructional manual and video. 1 x Wooden storage case. On some products we offer a choice of 1st Class post - this typically takes 1 to 2 days but is not a time guaranteed service. All non-Express orders are dispatched in order of receipt. Waste Electrical and Electronic Equipment Regulations 2006: We are registered under the Valpac DTS WEEE scheme, member number 400017. Please dispose of your used electrical items at an authorised recycling centre - if you do not know where your local centre is, please contact the Recycle More scheme for further information. VAT: All prices include VAT at the current rate. We operate under a point of sale system and do not issue VAT receipts with every sale. Supplier text and images used with UK distributor's permission where appropriate. The item "Testors Aztek 4809 Single / Double Action Airbrush Set in Wooden Case Multi Tip" is in sale since Friday, October 27, 2017. This item is in the category "Crafts\Art Supplies\Painting Supplies\Airbrushing Supplies\Systems & Sets". The seller is "timetunnelmodels" and is located in Fenton Barns, East Lothian. This item can be shipped to United Kingdom, Antigua and barbuda, Austria, Belgium, Bulgaria, Croatia, Cyprus, Czech republic, Denmark, Estonia, Finland, France, Germany, Greece, Hungary, Ireland, Italy, Latvia, Lithuania, Luxembourg, Malta, Netherlands, Poland, Portugal, Romania, Slovakia, Slovenia, Spain, Sweden, Australia, United States, Russian federation, Canada, Japan, New Zealand, China, Israel, Hong Kong, Norway, Indonesia, Malaysia, Mexico, Singapore, South Korea, Switzerland, Taiwan, Thailand, Bangladesh, Belize, Bermuda, Bolivia, Barbados, Brunei darussalam, Cayman islands, Dominica, Ecuador, Egypt, Guernsey, Gibraltar, Guadeloupe, Grenada, French guiana, Iceland, Jersey, Jordan, Cambodia, Saint kitts and nevis, Saint lucia, Liechtenstein, Sri lanka, Macao, Monaco, Maldives, Montserrat, Martinique, Nicaragua, Oman, Pakistan, Peru, Paraguay, Reunion, Turks and caicos islands, Aruba, Saudi arabia, South africa, United arab emirates, Ukraine, Chile.